We all ended up in Las Vegas, but had no clue any of the others would be there. Thanks to the Diabetes UnConference, I met up with two other type 1s from the Indianapolis area. One of them happened to be a longtime 50+ year type 1, someone I'd never met or heard of before. The two of us had never heard the other's name before, but at this event with almost 100 others, we found each other and made a connection that will stretch beyond Vegas and come back to our own community here in Indiana. To me, that's the power of the UnConference. This is what I want others to know the most, aside from what I've already written. That it wasn't about Diabetes Topic A or Topic B. Instead, it was about each of us. It was about connecting with others. Finding those conversations and being able to talk some initially, and then being able to continue that conversation outside of the conference setting itself and eventually back to our own corners of the world. Power of the #VegasDust, as it were. For me, I'm happy to have met many new friends while in Vegas and connected with many old friends I'd had the honor of meeting before. But it was the three-person group from Indiana that made really hit home the most about this event. While standing in line that first day, a few handfuls of us were chatting. I was striking up a conversation with the person next to me, as we moved along doing whatever it was -- grabbing coffee, or waiting to step up to some display posters on the wall where we could write down some questions about any particular D-topic. A friend from Minnesota was talking with another woman I hadn't met before, and while I was aware they were chatting, I wasn't particularly paying attention to anyone but the woman I was talking to in line. And that's when I heard someone say "Indiana." Yes, the lady that I didn't know mentioned being from there. And I spoke up, asking more. And as it turned out, were were both from the same area of Central Indiana. She heard about it from another longtime T1 there in the group, but had never heard my name before. And same for me. It was so great, being able to find someone from the same area of Indiana right there in Vegas. As it turned out, she is a 50-year Joslin medalist and at one point in the event the entire group stood to give her an ovation for her many years with T1D. I'm glad we were able to sit next to each other at least once, talking more and being able to exchange some hugs. And that's not all. There was another friend there from the same area. He's a type 1 himself, and I'd been lucky enough to meet this awesome guy in the past because of his role at one of the Indy diabetes companies. We also had some good chat there at the UnConference, and so much of that will remain in my heart. Before we all left, I made sure we could snag a photo together. And we have promised to keep in touch, connecting through the Indy Adult D-Community. That is what I hope can come from this UnConference, that so many of us can keep the conversation going and we can bring these types of conversations and meetups together locally in our own corners of the world. That it doesn't have to be a big UnConf event, but something we can organize locally over coffee, drinks, dinner, bowling, whatever it may be. 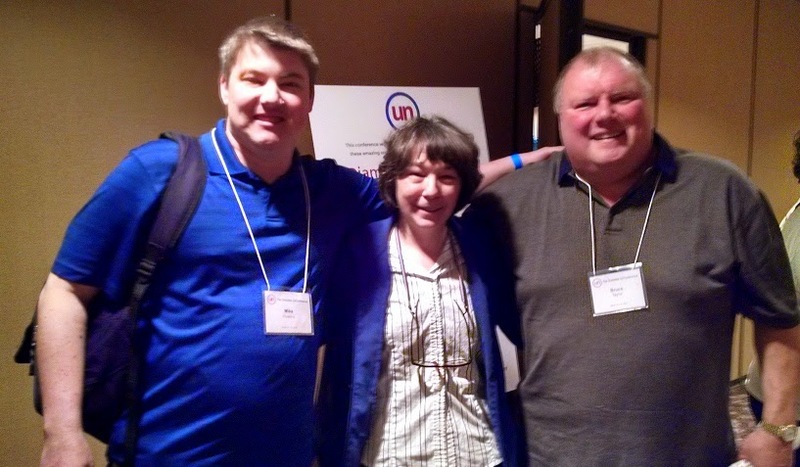 I am glad to hear word that there will be another UnConference in 2016, and there could be even another one on the East Coast at some point. That's great to hear. But before those times arrive, and whether they do or not, I'm so very happy to know that the three of us from Indiana were at the inaugural event. That we were able to connect there, and can continue what we experienced here at home. How much fun that you have new local friends. I did meet one person from the Minneapolis area whose name I knew, but I had never met. But I didn't get to spend much time with her. In fact, as wonderful as the UnConference was, there are so many people (about 90!) that I wished I had spent more time with. How thrilled I was to meet your two new friends, and to see you again in Las Vegas. I think your post really spells it out. The foundations of some really great relationships were built during those three days in the desert. Thanks! I certainly hear you about moving "home" (wherever that may be). The good news is that the community isn't as hidden as T1D (or T2D for that matter) as it once was, and with virtual communities its easier than ever to find fellow PWDs. Congrats on the move. Wishing you much success and happiness in the move. Dude, Where's My Meter Case?